First-class components, stainless steel process piping and valve bodies, heavy-duty PLC. It should work. Always. Certified as Class IIB medical device according to the Medical Device Directive 93/42/CE. Besides, the OXYSWING® Modular PSA Oxygen Generators are officially registered at the Ministry of Health (MOH) of various countries all over the world. Each OXYSWING® Modular PSA Oxygen Generator can easily be upgraded at any time simply by adding modules or by installing a so-called Dual-Bank in parallel without additional modifications. 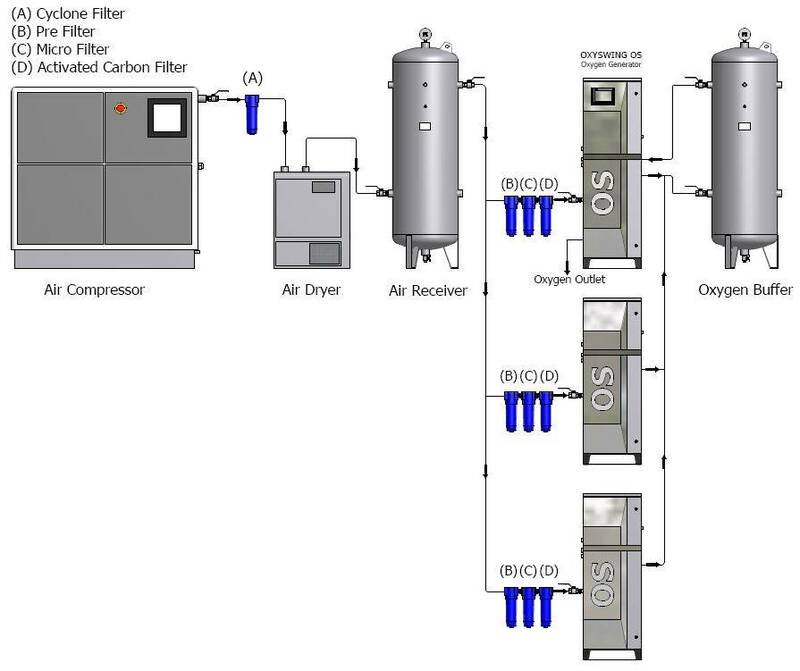 A Dual-Bank is a PSA oxygen generator identical to the standard OXYSWING® PSA oxygen generators, but without PLC and power supply, and which will be installed parallel to the standard generator. The Dual Bank will get its power and control signals from the OXYSWING® PSA oxygen generator through a single cable connection (master/slave principle). One OXYSWING® PSA oxygen generator is able to control up to maximum of two Duals Banks in parallel.